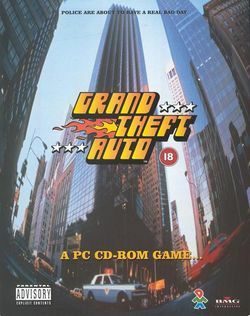 Grand Theft Auto, now known primarily as GTA 1, was the first game in the Grand Theft Auto series, released on PlayStation, PC and later on Game Boy Color. Many GTA games have been made since. Grand Theft Auto is set in Liberty City, San Andreas and Vice City in 1997. These renditions of the cities are vastly different from their more well-known counterparts in the GTA III era. In the game, the player can choose from one of about six protagonists, and even change their names. It begins with only one level to choose from. The player works for Bubby, and also for Don "Bald Man" Sonetti. They have the player do several jobs, ranging from stealing two taxis to killing the police chief. One mission also involves a trap set by Sonetti, in the form of a bomb on a bus that will blow up if it gets below 50 mph (this was inspired by the movie Speed). Once the player has enough points, Don Sonetti will want to speak to them. Apparently the player double-crossed him, and are a dead man if it happens again. Ironically, Sonetti is the one who double-crossed the player. Now, the player works for El Burro. Once the player does enough jobs, pleases him, and gets enough points, he'll ask them to come over to his place. The player did good work for him, and he is grateful. Now he's going to return the favor. He's going to reward the player personally this time, with a plane ticket to the luxurious Vice City. The police are constantly on the lookout for criminals. The player has a 'wanted' level, which reflects how much attention the police give them. At the start of the game this is at zero and the player is ignored, but when the player commits a serious crime, the police give the player more attention, and the wanted level increases, up to a maximum of four. At wanted level one, the police tend only to give chase if they are in the area anyway (but even a single wanted level will freeze and not dissapear, unless players can find a Pay 'n' Spray, whereas at four, the police set up roadblocks on major roads, shoot on sight, and send everyone available to the player's location. The more crimes the player commits, the higher the rating goes. Also, sometimes the player automatically gets noticed, if a mission leads to someone calling the police, or in the case of bank robberies that not surprisingly put the police on full alert. The game, with its violent subject matter, generated a great deal of controversy. However, this was deemed to be intentional, and was the first game known to have been publicised in such a way. Take-Two Interactive, the publishers of Grand Theft Auto, hired publicist Max Clifford to generate an aura of controversy about the game in the local media. As a result, politicians stepped into the foray. Whatever the impact on game censorship and the perception of video gaming, the publicity worked - the title was hugely successful simply because those attempting to ban the game were inadvertently generating publicity for it. This has been a known and recognised phenomenon of violent video games ever since. The parts of the cities are based on their real-life counterparts, such as Liberty City's neighborhoods. There are neighborhoods like the Brix, which is based on The Bronx, Brocklyn (obviously based on Brooklyn). Vice City has the same thing, featuring districts such as Vice Beach and Banana Grove, which are based on Miami Beach and Coconut Grove. El Burro, the man players would take missions from in the second part of the San Andreas missions, also appears in Grand Theft Auto III, he is the man that provide jobs in Portland, Liberty City, and is the leader of the Puerto Rican Diablos gang. Head Radio is one (if not the only) original station left. It was in this game, and it was also a station in Grand Theft Auto 2 as well as in Grand Theft Auto III and Grand Theft Auto: Liberty City Stories.